An adult Crested Caracara in Texas. Once hailed as the National Bird of Mexico, this weird falcon is a successful species that scavenges open lands across much of Latin America. When you think of a falcon, the image that comes to mind is probably of a compact, sleek-winged, speedy bird of prey that hunts in the sky. That describes the Peregrine Falcon, which is the fastest animal on Earth. There are about 60 falcon species around the world, and most are fast, aerial hunters. 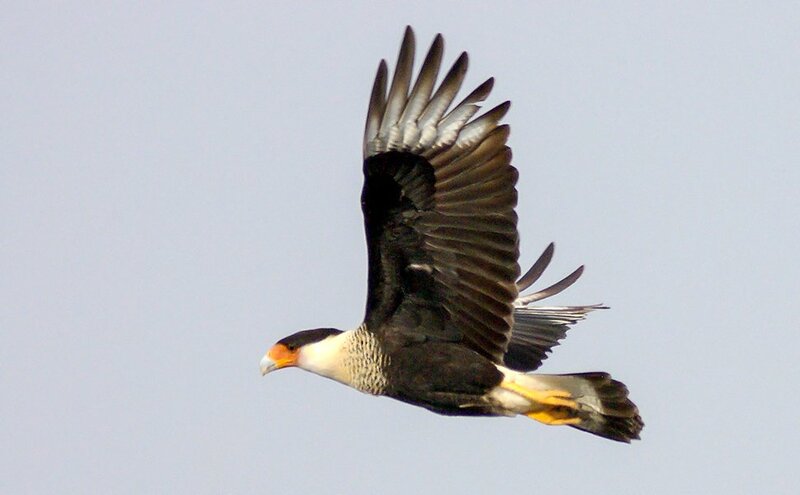 But the Crested Caracara (Caracara cheriway) is not your typical falcon. Although the Caracara has the hooked raptorial bill and some other similarities to its cousins, other anatomical and behavioral features set this bird far apart. A hawk-sized raptor with a flat head and heavy bill. Straight wings in flight give the bird an overall ‘cross’ shape. The black-and-white markings are bold compared to most falcons. Bright orange legs. Yellow or orange skin on the face, with a bluish-gray bill tip. Outer flight feathers are white in flight, as are the feathers under the tail. Walks on the ground or flies low, with flat wings. 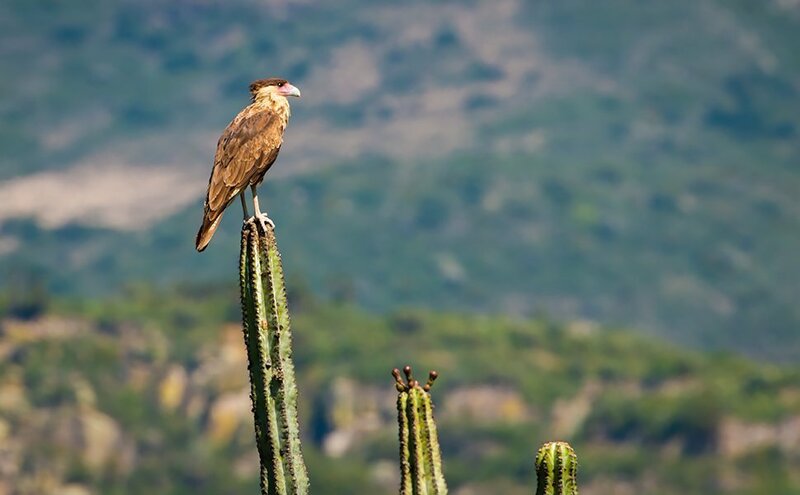 Often seen perched on cactuses or treetops, and among vultures around animal carcases. The Caracara’s diet explains why this bird looks and acts so differently from typical falcons. Most falcons are fast-flyers that catch live, fast-moving prey, such as other birds. The Crested Caracara is more of a generalist in its diet, eating live prey and scavenging for carrion. The latter is the bird’s main food source, and since it certainly doesn’t need to be fast to pounce on animals that are already dead, the Caracara evolved into a relatively slow-flying, sluggish sort of falcon. Like vultures, the Caracara has some featherless skin on its face. This is an adaptation to eating dead animals. 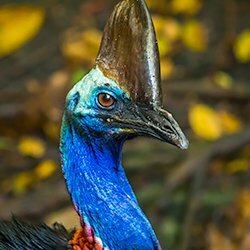 Facial feathers would get fouled up by blood and fleshy bits during meals, so it’s helpful for scavengers to have few if any of them. The Crested Caracara is often in competition with vultures. When caracaras can reach a carcass first, they will often try to defend this resource from any vultures that arrive later. They will also steal food from vultures and other birds given the chance. Caracaras often patrol highways, looking for an easy meal of roadkill. When Crested Caracaras eat live prey, they hunt small animals such as reptiles, insects, worms, crabs, and similar creatures. Baby birds are also a favorite snack. Caracaras tend to either fly low or walk on the ground while foraging. In fact, they spend a lot of time walking around, which is rare among raptors. This is why they have such long legs for a falcon and claws that are relatively flat. Where do Crested Caracaras Live? The Crested Caracara is common in open lands throughout much of Mexico, all of Central America, and the northern half of South America. It is at its northern range limits in the United States. Here, it’s found in the states of Arizona, Texas, and Florida. 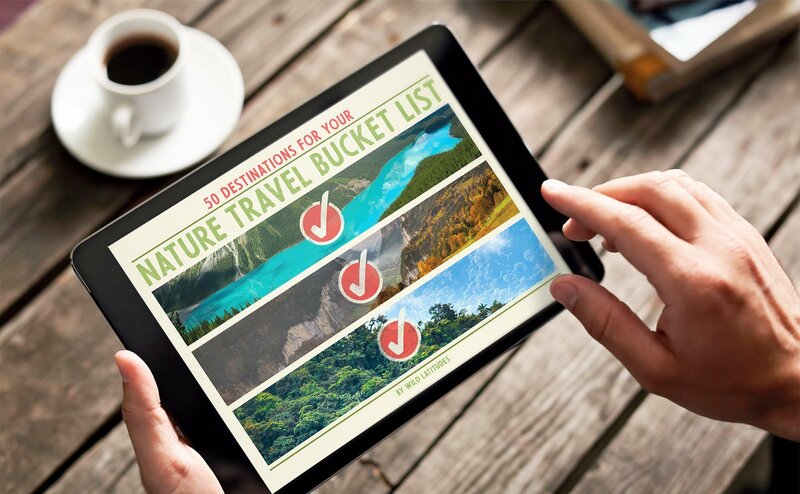 The population in Florida is a relict from before the last glacial period, which ended about 12,000 years ago. 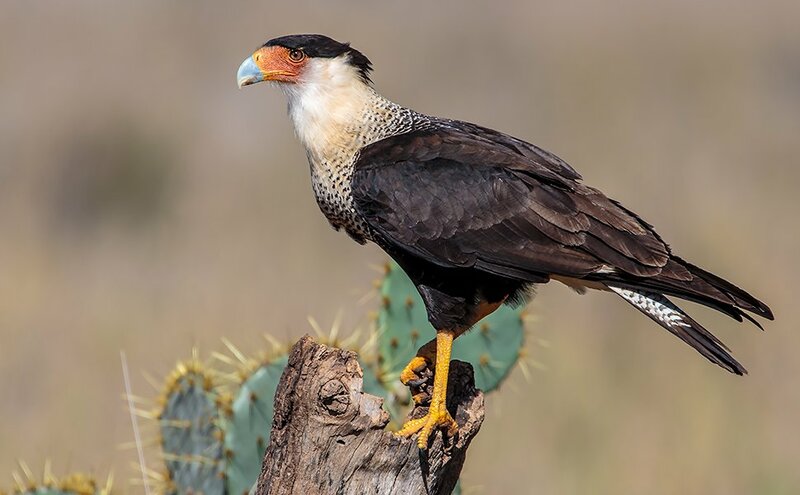 We may see more Crested Caracaras running and flying around in the U.S. in the decades to come, as the average temperature rises with climate change. Habitat modeling by biologists suggests that the Caracara may expand its range northward over the next century. Preferred habitats for the species are open landscapes, including desert scrub, prairies, woodlands, agricultural areas, and cattle ranches. The National Bird of Mexico… or is it? 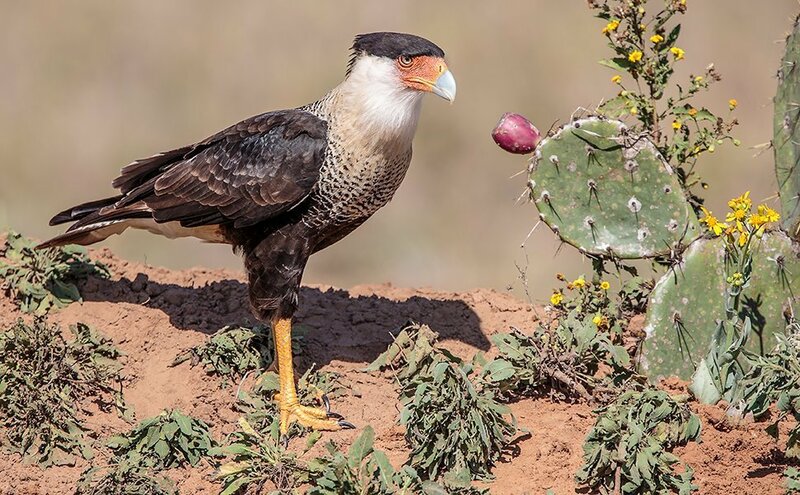 A claim to fame for the Crested Caracara is its iconic status in Mexico. Some archaeologists tell us that Aztecs and other pre-Hispanic peoples revered the Caracara. For a time, some scholars thought the ‘eagle’ depicted on Mexico’s flag was actually supposed to be a Caracara. The Crested Caracara was therefore esteemed as the National Bird of Mexico. But further study suggested that the bird on Mexico’s flag is actually a Golden Eagle. The Golden Eagle then supplanted the Caracara as the National Bird of Mexico. 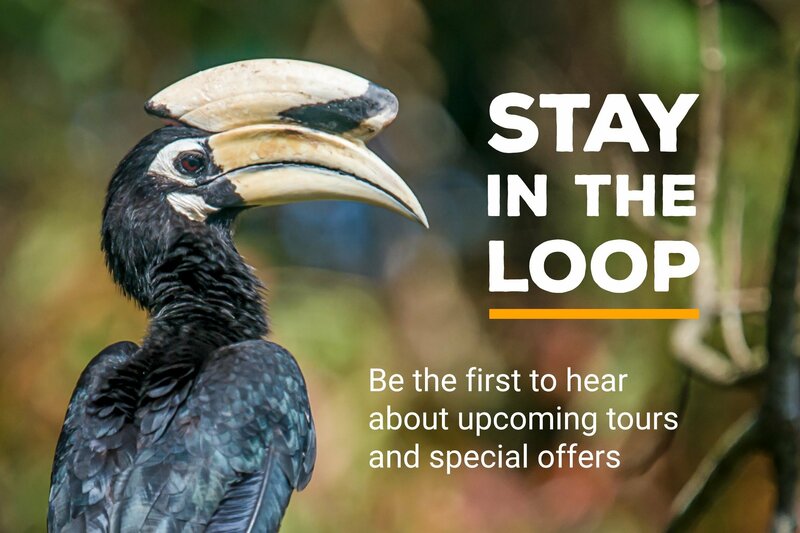 However, you’ll still see the Caracara referred to as the national bird by some sources. The Crested Caracara isn’t the only oddball falcon of its kind. There’s a whole subfamily of caracaras within the Falcon family (Falconidae). There are about 6 other species in this group (the taxonomy is still being sorted out). Caracaras of one species or another live throughout Latin America, as far south as Tierra del Fuego at the tip of South America. 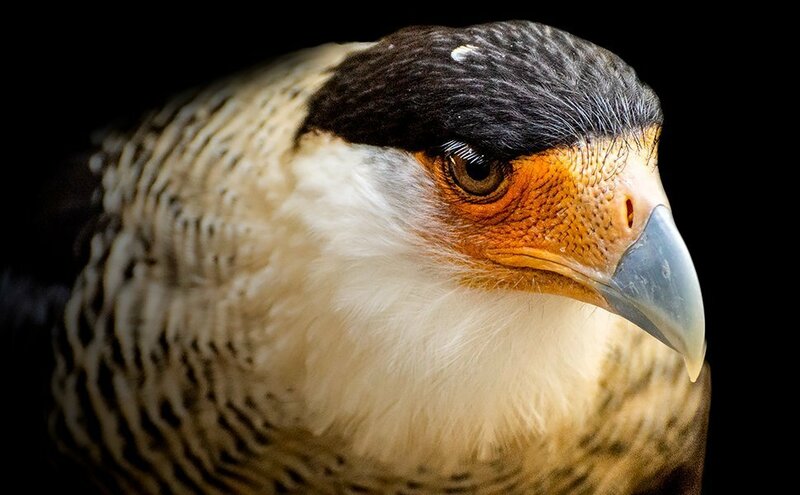 Genetic studies using mitochondrial DNA point to the time when the ancestral caracaras split off from the other falcons: between 14 and 7 million years ago. So for millions of years these long-legged falcons have been adapting to the opportunistic, slow-paced life of a scavenger, leaving the Peregrines and other typical falcons to zoom through the skies.